Blackjack is one of the most popular games both at brick and mortar casinos and at online casinos. However, some players may have already noticed that there is a small difference to how blackjack is played on land and online. In this article we will discuss some of these differences to give players a rounded knowledge on the topic. In blackjack, luck and skill are the main components and players need to know some strategic tips in order to be successful. A successful player will receive returns of 99% whereas a not so skilled one may be far away from 90%. 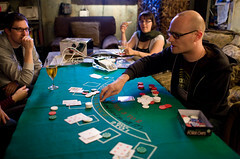 In land casinos players are required to have memorized the strategy because it is not something they can figure out at the tables. However, when playing online players can use the strategy feature in the auto play option so that the software plays the game using the correct strategy. This is better for new players. In land casinos players are also not allowed to carry the strategy card with them and strategy differs with the blackjack rules of every place so a player would have to memorize different strategies for different casinos. This problem will never be found online. Another advantage of playing online blackjack is that at land based casinos only standard formats of blackjack are played. It is true that some casinos may follow the no hole card rule and in some casinos the dealer may be allowed to hit on a soft 17, but the basic game is not tweaked. When you play online there are blackjack variants that have been created to change the structure of the game like Double Exposure which gives players a chance to see both the dealer’s cards dealt face up so they can have more information but there are lower payouts. I strongly encourage you to check out The Virtual Casino’s blackjack games and I am sure you will enjoy them greatly. At online casinos you will find a lot of card games as they are an integral part of online casino gaming. If you are used to poker as a card game you probably think that card games are played with only one deck. However, for other casino games, such as blackjack and baccarat, several decks are used and it is important to know this because the number of decks that are used in a casino game affect the house edge. New players are often unaware of the number of decks used in the games but this is crucial information because it afects the average payout ratio and you could make the wrong choice if you do not know this. At most casinos the decks vary from 1 to 8 in games like European Blackjack, Atlantic City Blackjack, Vegas Strip Blackjack and Vegas Downtown Blackjack amongst others. In Blackjack games the house edge increases as the number of decks in a game increases. To make this clearer, the house edge is the percentage of each dollar wageres that the casino keeps in the long run. For example, in MicroGaming’s Vegas Downtown Blackjack the house edge with 8 decks is 0.64%, the house edge with 2 decks is 0.40% and the house edge with 1 deck is 0.01%. But for MicroGaming’s Vegas Strip Blackjack The house edge with 8 decks is 0.43%, the house edge with 2 decks is 0.18% and the house edge with 1 deck is -0.18%; meaning that in the long run the house will lose money. Often, players like to venture into the games with higher number of decks because they are more realistic in resembling land-based casino environments, but players should be aware that there is a high price to pay for the thrill of playing multi hand games. For Baccarat the deck situation is different. As you are able to choose to wager on one of three different bets (the Banker, the Tie and the Player) you should consider each one separetely. In the eight deck variant the house edge is 14.36%, which increases to 15.75% in the single deck variant. For the Player Bet the house edge is 1.24% with eight decks. Players who bet on the Banker often should stick to one deck Baccarat games; however if you, for some reason, like to bet on the Player you should go for Baccarat with eight decks. The Tie Bet has the highest edge for the house, so try to stay away from that one as often as possible.